Everyday Dharma: Seven Weeks to Finding the Buddha in You offers a simple guide to achieving real and lasting personal transformation. This book appeals to any who are open to Buddhism in the broader context, whether one subscribes to a specific religious view or to no view at all. Dharma, a Buddhist term for the actions taken to find one’s inner-wisdom, is really a universal concept. "If wisdom were a destination," Lama Willa says, "Dharma—played out in our thoughts and actions—is the path leading there." By applying Dharma’s essential truths to the modern world, Everyday Dharma teaches you how to do the spiritual, emotional and psychological work in order to bring about day-to-day well-being. Lama Willa believes the art of being happy is the true enlightenment available to us all! Drawing from her personal progression from a young and inquisitive college student into an ordained Tibetan Buddhist minister, Lama Willa offers sincere, insightful guidance with the early questions that so naturally surface when beginning a spiritual journey of any kind. Questions such as "How does one awaken their life-intention?" and "How does one become mindful?" are approached with practical clarity. Speaking in a language that is friendly and easy to understand, this workbook is particularly accessible to the Western spiritual student. Everyday Dharma is patient, relaxed, and best of all, fun! To be used individually or in a group setting, this seven-week initiation composes a chapter per week, with each day outlined for study. Through daily exercises, inspirational passages, and insightful tips, Lama Willa creates a non-dogmatic system for putting the wisdom behind Buddhist thought into real-life practice. Quotes from inspiring minds such as Maya Angelou, Helen Keller, and John F. Kennedy color each day with heart-warming support. Daily exercises include feel-good tasks—for instance—smiling at three people you wouldn’t ordinarily and demonstrating three acts of giving. Drawing profusely on the richness, subtlety, and psychological astuteness of the Tibetan wisdom tradition, Lama Willa manages to make it all seem simple and actually doable in our day-to-day lives. She persuades us that we, even we, can be spiritual heroes — that enlightened altruism is a joyous come-as-you-are party. — Dean Sluyter, author of Why the Chicken Crossed the Road and Other Hidden Enlightenment Teachings, The Zen Commandments, and Cinema Nirvana: Enlightenment Lessons from the Movies. I consider Lama Willa to rank among the most highly trained and spiritually profound current Western teachers of Tibetan Buddhism. Having practiced for decades under the guidance of several of the leading Tibetan lamas of the twentieth century, she completed two three-year meditation retreats, was formally installed as a lama, and requested by her own teachers to teach the ways of Buddhist enlightenment to the contemporary world. Lama Willa’s way of teaching is fresh, accessible, welcoming, and profound. She speaks with clarity and simplicity to the widest possible audience—readers of any spiritual tradition or none. 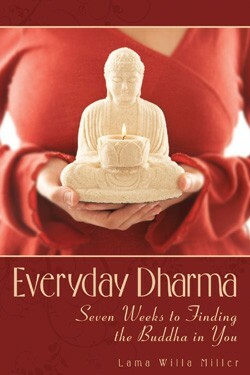 She masterfully connects ancient teachings of Buddhism to numerous facets of modern life and contemporary concern. Like revered and profound spiritual teachers of the past, in this remarkable book, Lama Willa masterfully opens a door for us into our own hearts, where she helps us glimpse, and then bring forth, the profound goodness that we always were. Whoever takes up the meditations and teachings of this book will never be the same. Here are words from a truly wise woman to help us live more fully, effectively and wisely, and to share our gifts with the world. — Roger Walsh, M.D., Ph.D., University of California Medical School, author of Paths Beyond Ego, Essential Spirituality: The Seven Central Practices, A Sociable God, and World of Shamanism.